The MPFI Electron Microscopy (EM) Core Facility of Max Planck Florida Institute for Neuroscience (MPFI) now is a ZEISS labs@location partner institution. MPFI will have access to state-of-the-art ZEISS technology before it is commercially available, providing researchers with innovative imaging tools that will empower their search for new insights into how the brain works. Aside from Salk’s Waitt Advanced Biophotonics Center and Carl R. Woese Institute for Genomic Biology, MPFI is only the third institution in the United States to earn the labs@location designation. 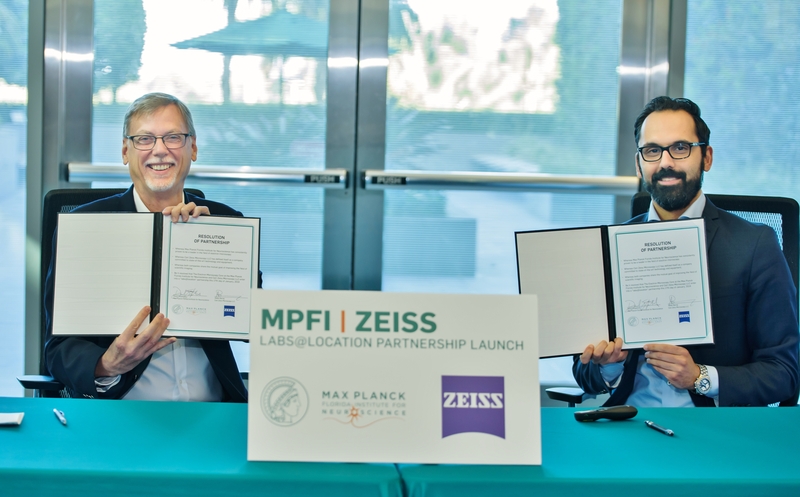 MPFI and ZEISS launched the partnership in January 2019 at an event that included lectures focused on Correlative Light-Electron Microscopy (CLEM), facility tours, and a partnership signing and reception. The first piece of equipment made available to MPFI scientists is known as the “Focal Charge Compensation module (FCC)”, which is integrated onto a Serial Block Face Scanning Electron Microscope system. The FCC introduces a local stream of nitrogen gas onto the sample inside the microscope, which absorbs unwanted electrical charges that interfere with imaging. MPFI received the FCC equipment in August last year, and was the first institution in the United States to use the technology after ZEISS made a number of significant improvements to the current commercially available model.